Papers, Papers, Papers! I have a long three years ahead of me but I am up for the challenge. Last week I had a gentle reminder of the benefits in the Word of God. Sometimes it is a little challenging for me to find certain articles in my school library so I use Google Scholar quite often. I have signed up for so many free periods of sites and then canceled before I could be billed. Last week I had to write a short dialogue to be turned in by midnight and I needed an article like always so I googled to find some. I landed on this particular site and noticed that if I wanted to see more than the abstract I would have to be willing to invest my funds to view. Right when I was about to type in my credit card number I heard Holy Spirit say, “You can read that article for free on the school site.” Now listen, this was a big deal for me not because it was free but because I listened. I like working ahead and doing it the easiest way. However, that is not always the most economical way. I began to give the lame excuse about not always finding what I want and I did not get a response at all (LOL). It was like Holy Spirit ignored my whimpering. So, I head over to my school site and sure enough I find the article with no problem. After I obeyed His leading, I begin to hear Holy Spirit speaking again. Holy Spirit started to share how so many believers never tap into all of what God has for them. His first reasoning was because they don’t know what all of the possibilities are that exist for them. Why would you pay for something that you can get for free? Why suffer in silence when Jesus paid for a public display of His glory? Why stay bound when liberty is available? Then second He said, “Don’t be lazy. It’s too expensive.” Immediately I knew it was not about the paper because I could pay for that with no problem. It transferred over into every area of my life because if I am too lazy to search through the free articles I’ll be too lazy to search through the Word to get my free answer. Woo, I cannot afford that at all! Let me encourage you today to take advantage of what is inside of our life plan that the Father has laid out for all of us. Get into the Word of God and discover the endless benefits the Father has created just for you. Don’t spend your time, talent, and money paying for something that is already paid for. It makes me think of the woman with the issue of blood. She spent all her money on trying to get better and only grew worst until Jesus, the One Who had her answer for 12 years ago, comes along. The woman with the issue of blood finally decided to take from Jesus instead of letting others take from her. Jesus has the answer you are looking for. Stop today to invest in yourself by placing your finger in the Word of God. He wants to be your man with benefits! I love you my sister. Hopefully, I will see you in July at the God’s Glamorous Girls conference where we can dive into the Word and thank God for His benefits together. Thank You. Just what I need this morning. Thank You Dr Dee Dee! Great! Great! Just what I needed to start the week. Thank you Pastor Dee Dee. See you in July. Thanks for sharing Dr. Dee Dee and for teaching us to listen to Holy Spirit in every area of our lives. Whew….thank you, I needed that reminder. Great word Dr. Dee Dee!!!! Much Love!! 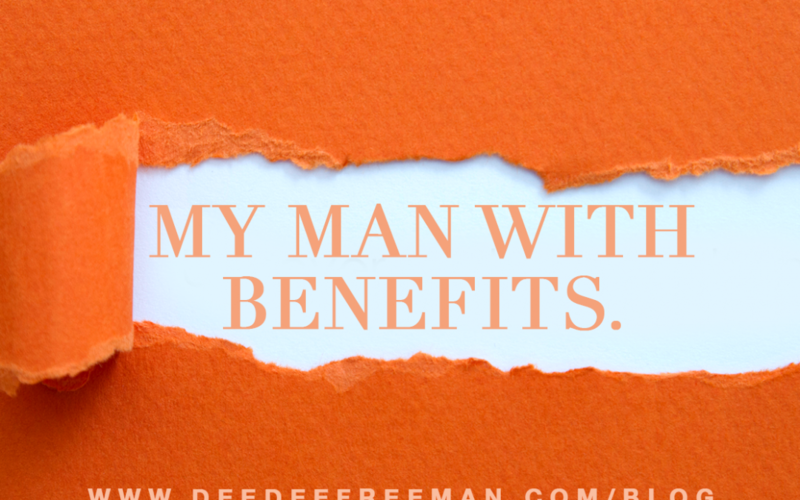 Awesome word Dr. Dee Dee, Thanks for reminding me I have a man with benefits and I do not have to want for one single thing!!! I love it! That’s going to be my new declaration, confession, mantra, all the above 😁😄😍 “I got a man with benefits!” Thanks for the reminder! Excited to see you at GGG Dr. Dee Dee! Much love! THANK YOU FOR SHARING,ALWAYS A BLESSING READING YOUR BLOGS,AGAIN THANK YOU. Omg. “Don’t be lazy it’s too expensive”. We pay for a lot of things that back in the day our parents did it themselves . From house cleaning, cooking, polishing their nails and the list could go on! Spiritually we have the Holy Ghost to help us in all things. We just need to ask, listen and obey! That was awesome word and I needed that today! I Thank God for you! I like that, My Man with Benefits… Already paid for Benefits. Why pay for something you can get for Free!!! That message was right on time. Thank you. Please join me and my cousin Shirley (daughter of “Grandma” Laura Mack-RIP⚘) as we graduate together from Strayer University. We are receiving our Bachelor of Business Administration degree. It’s a monumental moment in our family to have 2 cousins graduate over the age of 50😁. Wow!! Such a timely message for me. I always look forward to reading your blogs on Monday. Awesome… finally decided to take from Jesus instead of letting others take from her. Thank you so much for this word. It is right on time. Omg, good word as usual. Thanks so much, Mom! Amen! Isn’t it wonderful when Holy Spirit ministers to you the answers to every situation in your life. Everything he has layed out for us is in God’s Word. We just have to slow down, take the time and research. Thank you my sister in the Lord. Lord willing, see you at GGG in July. Excited about coming to my first one. Awesome word!!! See you at GGG2k17!!! Thanks Dr. DeeDee for this on time word! Hope to see you in July!! It’s about to go down @GGG Thank you Jesus! Awsome guidance Dr. DeeDee….. I am still in awe at how I was trying to read your message and at the same time Holy Spirit was taken me here and taking me there to the conversations I had with a couple of people just a few weeks ago. This was confirmations. To know Him and to recognized is so fulfilling. He even took me back to Pastor Mike teaching on Sunday where he talked about stuff not making you happy or should I say full. This relates to a conversation that I had with my aunt last Friday when I was in Miami and went to visit her. I was telling her how full I fill when I wake up in the morning. I told her I feel like I am rich because of the Joy and happiness I feel in my heart since I came to know Him. He was my missing piece. Then Holy Spirit took me back to another moment a few months ago when I was meditating and asked Him what is it that you will have me to do to please you? I had my eyes closed I saw The Book fall from a shelf and heard stay in my word. So you see this is why I say He had me all over the place. He was giving me Confirmation Dr. DeeDee to what you were sharing. Thank You for allowing me to see Him through you! This morning I woke up with pain in my arm/chest. I thought of every way I could get to the doctor this morning (during my prayer time). At the end of Prayer I was silent. . .listening for What God had for me. He directed me to Jeremiah 30:17. . .and there I found my FREE health! Before I knew it (at some point through the day), I had to think about the fact that my arm hurt this morning. Free medicine was BETTER than what I was going to pay a doctor. Thanks for this posting. . .I’m encouraged! Yes Dr.DeeDee. I have to learn to get with my daddy’s bennies! Top of every Forbes “Best Places to Work” list both past and future! I absolutely LOVE how you can find a way to minister through any situation in your life. It’s very refreshing and encouraging. Thank you so much for remaining diligent to pump these blogs out with your incredibly busy schedule! Dr. DeeDee, thank you for this empowering message. Why pay for the same real estate twice? Why sit in laziness and suffer when you can stand in the benefits of Holy Spirit? Holy Spirit is our helper! Amen!!! Listening to the Holy Spirit is the key to success! Thank you so much for sharing your life! Love you so much! I am excited about GGG!!!! Truly, Holy Spirit does have all the answers and He’s willing to share them with me. Great reminder. Thanks Dr. Dee Dee so very very true!! Thank you so much for the confirmation. I was busy entertaining family this week and haven’t had my study time in the word. I must admit just before reading this article the Holy Spirit had just reminded me to pick up the word to read. I can certainly agree with those papers. Thank you for this relevant message. Great article. So glad to be reminded about our benefits as believers. Thank you. That was great. An awesome reminder that God has the master plan and I have to put all my trust in him because he will never let me down. I was feeling real down this morning like the weight of the world on my shoulders but after reading this I know I need to realign my faith and put ALL my trust and faith in the man with the benefits and that is HIM.